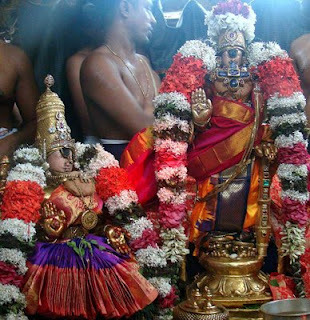 Panguni Uthirum is a festival celebrated by tamilian Hindus and usually falls in the months of March or April. It is celebrated with great pomp in the state of Tamil Nadu. According to legend, the marriage of Parvati and Parameshwara, Muruga and Devasena, and Andal and Rangamannar took place on this day. The prime attraction of this day is the art form, Kavadi organised at all the Lord Subramaniya temples in the state. Lots of preparations are made to decorate the temple streets for this festival. The most tedious task is decorating the kavadi. Each kavadi is highlighted uniquely. No two kavadi should look the same. Also the chariot on which the idols of the gods are carried is ornamented exquisitely. The streets are lighted up with fairs and the parades that are organised are a feast to the devotee's eyes. On this auspicious day, the womenfolk offer cool beverages like buttermilk and food to devotees. There are various delicacies for Panguni Uthiram; some well known are payasam, Sarkarai pongal and vegetarian meals. A grand feast is organised by the temple authority for the devotees. An invitation for the occasion is sent all over the state. Usually paper notices are distributed with a list of the Puja ceremonies. You can now send online invitations with Yoovite. Celebrate with great joy, the wedding anniversary of Siva and Parvati and seek blessings from them for a happy married life this year.